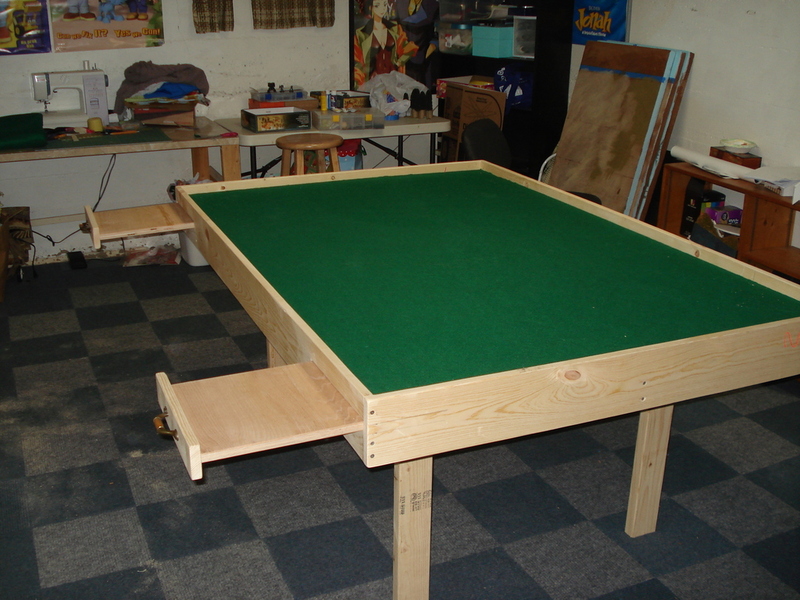 I had been wanting to upgrade my gaming table in my basement for some time now, and with a week vacation, this was the perfect time to get it done. So over the weekend, my dad and I stopped into the local hardware store and picked up some lumber. I was originally planning on doing it all at home, but since I was going to be visiting my parents anyways, I figured I’d take advantage of my dad’s knowledge and workshop for this project. As for tools, it can all be done using a circular saw, a drill, a screw driver and a staple gun. Some other tools, like clamps, chisels, squares, etc. are useful but not mandatory. Once we had all the supplies, we started on the inner frame and the legs. 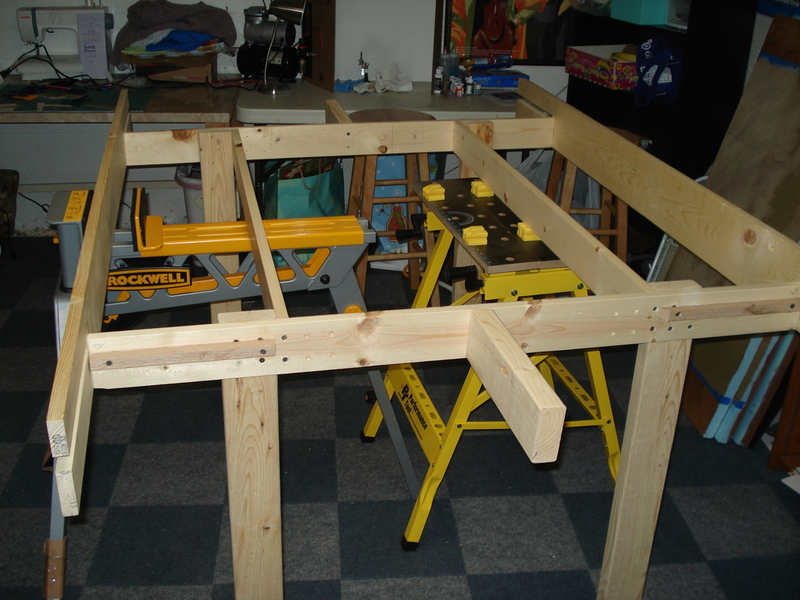 The 2×4’s were cut into four 29″ lengths for the legs. From the leftover 2×4’s, I cut two 12″ sections that would be used to help support the ends of the table. The two 1×4’s were cut so that we had two 48″ boards and two 46.5″ boards. 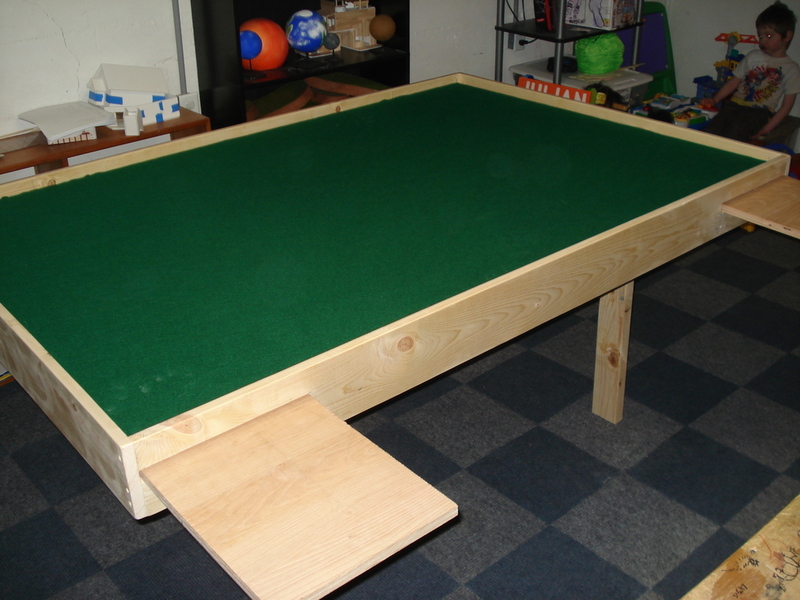 The 48″ boards would support the width of the table and hold the long sides on. Next up was the 1×6’s. Two of them were cut to 49.5″ for use on the table ends. Since the table was going to be 6′ long, it wasn’t necessary to cut the other two boards, but we did cut slots into the ends for the shelves. On each end of the 6′ board, we cut a 12″ long by 1″ wide groove. The top of the groove was placed exactly 3.5″ up from the bottom of the board, so that the shelves would be supported by the tabletop when they were extended. Now that the frame pieces were cut, it was time to assemble it. First up, here’s a picture of the inside frame with the legs and long sides attached. In this picture, the runners for the shelves are visible. They are 12″ long pieces of hardwood that were attached 7/8″ down from the top of the wood to support the shelves when they are pushed in. Another picture of the inner frame from a different angle. Yet another picture of the inner frame, this time from the far end. 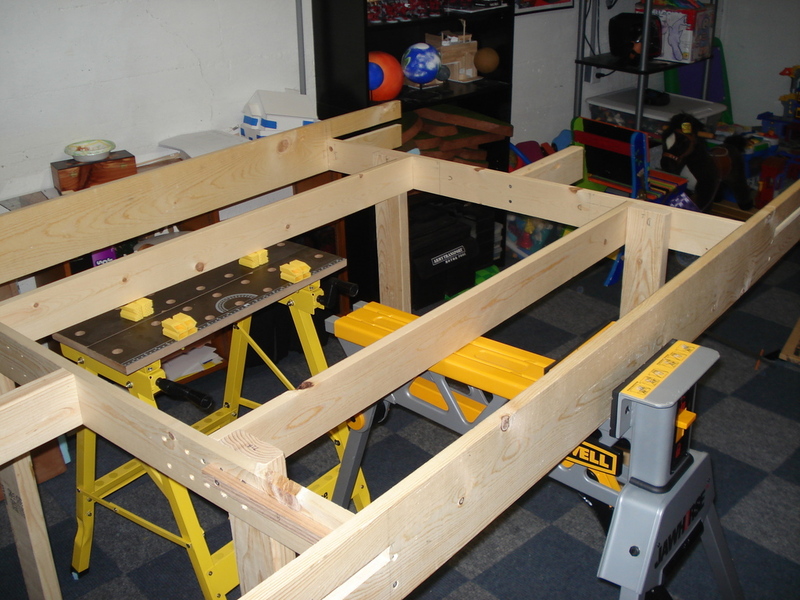 The frame is now complete with the ends attached. The other side of the shelf runners are visible here, again placed just below the slots in the front panels. 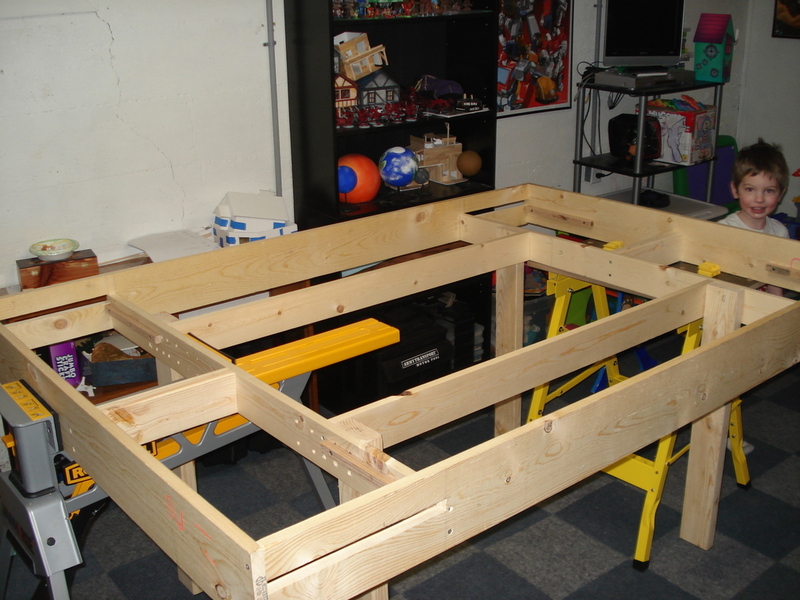 Once I had the frame home and assembled, I had to go get the table top. Since I had no way of transporting a 4×8 sheet home from my parent’s I had to buy it here in town. Luckily a friend of mine had a truck I could borrow. As I mentioned earlier, I went with OSB board because it was cheap and I planned to cover it with felt. If I wasn’t covering it, then something else would have been better, because OSB is ugly. It’s also a pain to work with. I used my saber saw to cut it, and the blade did not want to stay straight. 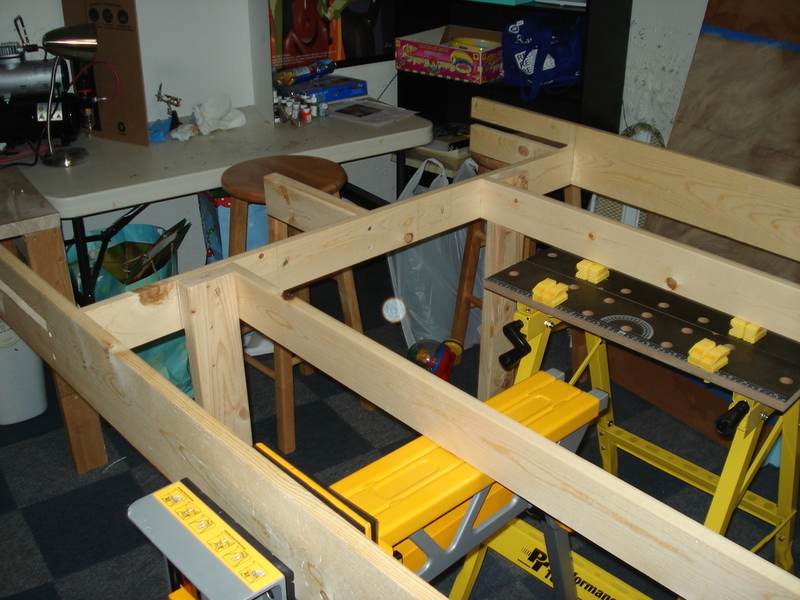 I ended up with one really ugly edge, but it was close enough to 6′ long that it didn’t matter. After cutting the sheet to 4’x6′, I covered it with a big sheet of felt and stapled it all around the edge. I then dropped the whole sheet into the frame. Things were starting to look like a table at this point. For the shelves, I cut the 2’x4′ sheet of hardwood into four shelves that were just under a foot wide (11 and 7/8″ to be precise). For the front of the shelves, I cut the leftovers of the 1×6 boards to 13″ long, and then cut those down the center lengthwise so I had 4 boards that were 13″ long and 2 and 7/8″ wide. To these I attached some drawer handles, and then glued and nailed them to the front of the shelves. The final step was to attach a small piece of wood to the bottom of each shelf so that they could be pulled out too far. So there you have it. 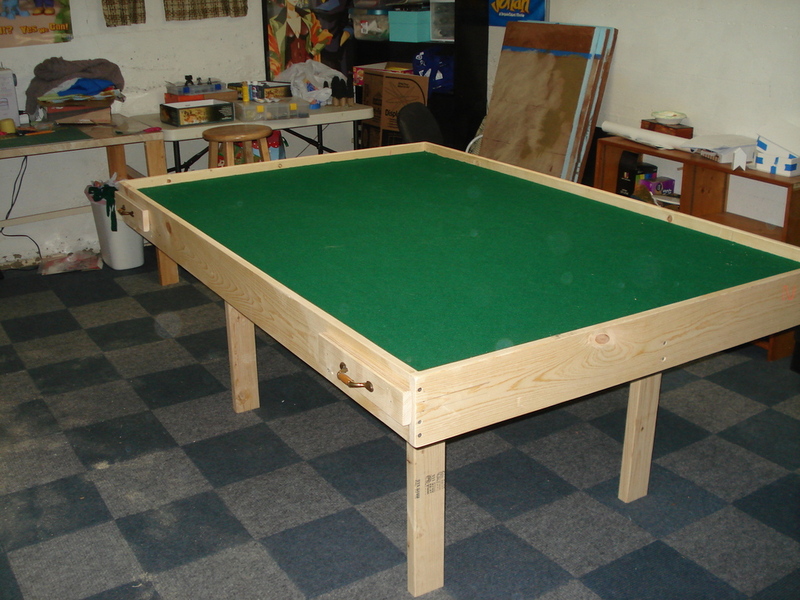 The game table is a full 4’x6′ size, perfect for playing games Warhammer. It has four shelves (one in each corner) to hold models, drinks, dices, etc. 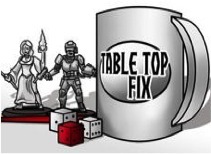 It has a 1.5″ raised edge around the entire table, so dice don’t go rolling off. 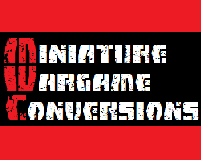 And the tabletop is 30″ off the floor, so it’s prefect for both sitting and standing. 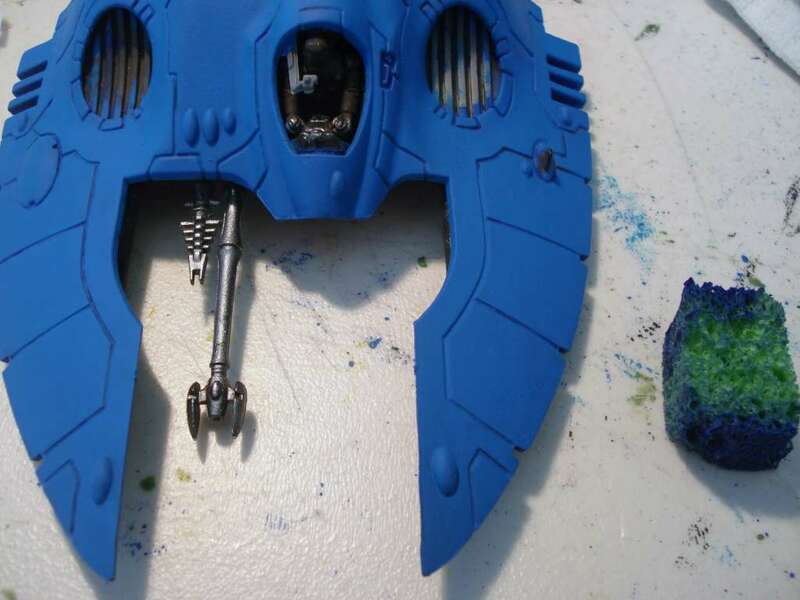 I’ve been working on the Falcon all day, and figured I’d give a kind of step by step through my painting process for the camouflage and the details. Here we start with the plain tank without any detailing and the small (1″x1″x2″) chunk of kitchen sponge. I add some dark blue to my palette and water it down just a hair. I don’t want it too thin or it will run or get absorbed into the sponge. I dip the sponge in the paint and then give a few dabs onto a piece of paper so it’s not to thick. Then I start lightly dabbing it onto the tank. Here’s a picture after the entire tank has been done with the sponge. As you can see, some of the areas weren’t very well covered. 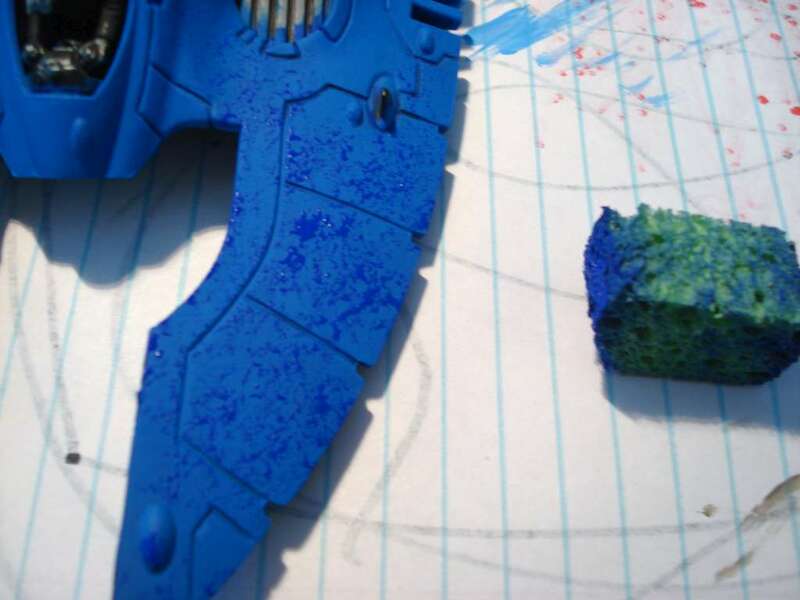 It’s tough to get into the tight areas with the sponge, so I use a brush for those parts. I take an old brush, dip it in the blue and then give it a few dabs on paper to get any excess paint out. 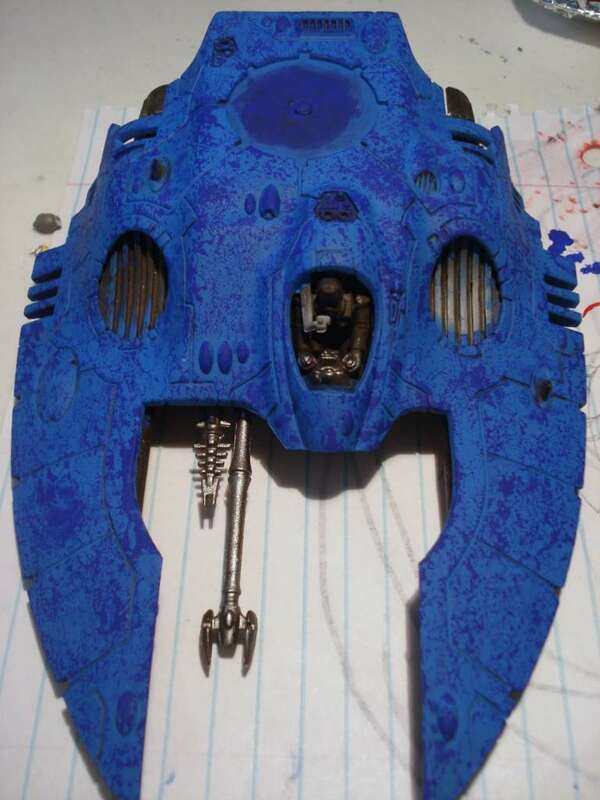 Then I lightly dab paint onto the tank in the areas the didn’t get very good coverage with the sponge. As you can see the camo is much more uniform. Then it’s just a matter of filling in the details, like the gems, the lining, etc. 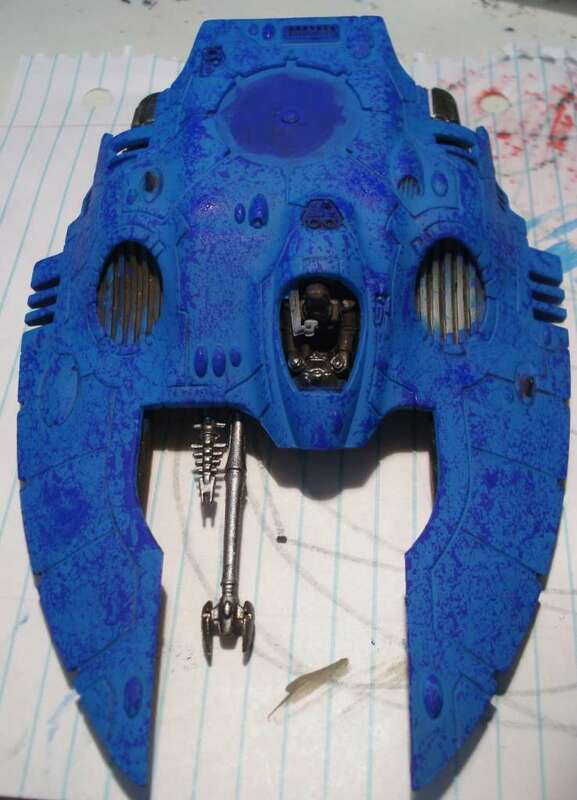 Here is a picture of the tank so far. 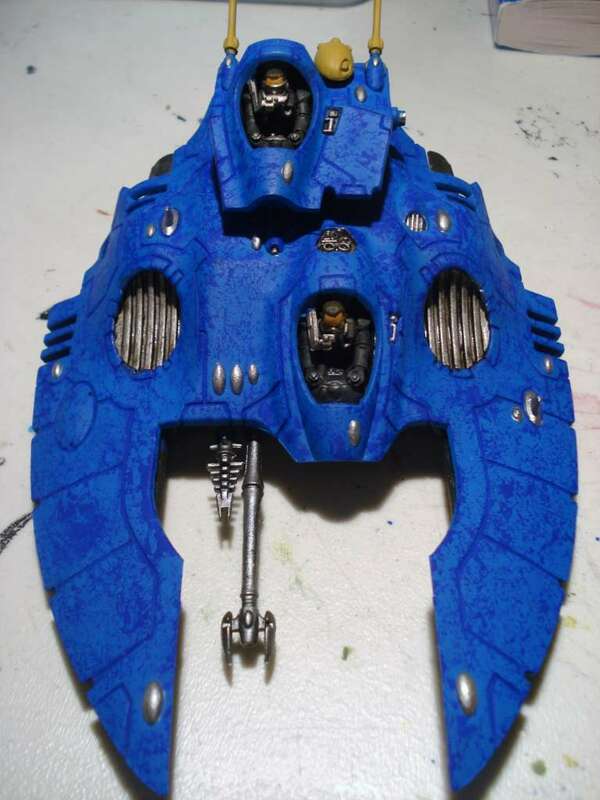 It need the light blue highlights, some bright yellow on the antenna arrays, and some decals/icons.